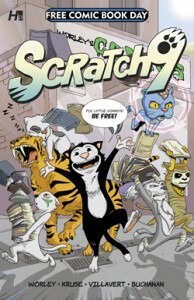 Also on Free Comic Book Day, look for the special issue of Scratch9 to be released by Hermes Press. In case you don’t remember Scratch9, it’s the Eisner-Award nominated full-color all-ages comic book about a cat with the magical ability to summon the spirits of any one of his nine lives to help him in his adventures. It’s written by Rob Worley and illustrated by Jason T. Kruse. This special FCBD edition re-prints the premier issue with a brand new cover (by Armand Villavert, Jr.) and some brand new back-up material.